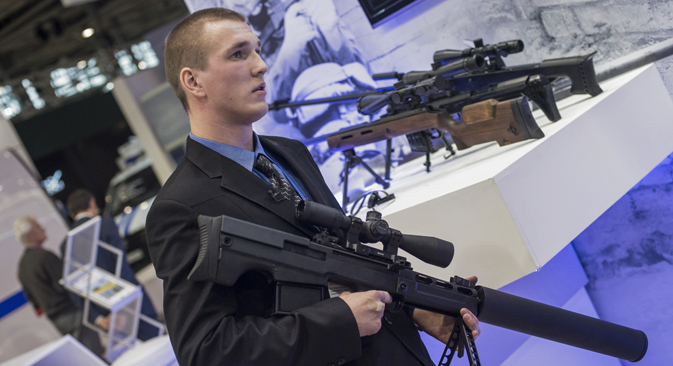 A staffer holds a silent anti-materiel rifle "Vykhlop" presented on the stand of Rostech companyat the International Exhibition of Homeland Security Interpolitex 2015. Oct. 20-23 saw the 19th Interpolitech international exhibition of state security equipment, organized by the Ministry of Internal Affairs, Federal Security Service and the Federal Service for Military and Technical Cooperation. The combat capabilities of state-of-the-art arms and equipment were also demonstrated at the range in the town of Krasnoarmeisk near Moscow. RBTH has chosen a selection of the most interesting innovations from the exhibition. The 12.7-mm VKS anti-materiel sniper rifle, also known as the Vykhlop ("exhaust"), strikes different targets at a distance up to 650 yards (600 meters). Due to its large caliber, the weapon can penetrate even heavy body armor and soft-skinned vehicles. Meanwhile, the company Unmanned Systems showed off its vertical take-off and landing (VTOL) drone BS-103. The drone has two flight modes: "airplane" (horizontal) mode and hover mode (similarly to a quadcopter). This means launching such a drone requires neither a catapult nor tossing into the air by hand. The UAV (umanned aerial vehicle) is equipped with five brushless motors. In the hover, vertical takeoff and landing modes, four engines with vertical thrust operate, while a fifth, sustainer motor with a horizontal thrust also runs in horizontal flight. The drone can also be equipped with internal combustion engines, which significantly increases the time and distance of flight. As the BS-103's developer Sergei Alexandrov told RBTH, the drone can be used by oil and gas companies for monitoring oil and gas pipelines, by border guards for protecting and monitoring areas as well as by logistics companies to deliver small loads. Visitors to Interpolitech 2015 were also shown a number of different dual-purpose robot systems; incidentally, the robot called Engineer was shown in action right in the exhibition hall. Produced by the company Servosila, Engineer is a small, all-weather robot for use both in civil applications (for cleaning up after technological disasters) and by the military, for example, to fight against terrorism or in urban combat. Engineer can be sent to remote places; it is suitable both for complex terrain and urban environment. Due to its caterpillars, it easily overcomes obstacles such as sidewalks and even ladders. The robot, which looks like a miniature tank without a turret, has an arm-like manipulator and is equipped with a laser scanner, a stereo vision system, odometry sensors and a video camera, which it can raise to a height of 4.25 feet (130 cm), which increases its vision range. Due to its devices, the machine can not only send three-dimensional data to the operator, but also build digital maps of its route and move independently, if contact with the operator is lost for some reason. In its Interpolitech booth space, the Russian company TS demonstrated its toughened computer equipment. The laptops and tablets were poured with water and strewn with sand as well as beaten with hammers, but the equipment continued to work. According to the developers, the computers are designed for use in extreme conditions, such as in the Arctic, in the desert, on the deck of a ship in a storm, and so on. The equipment works at temperatures from -58 to +131 Fahrenheit (-50 to +55 degrees Celsius), in the pouring rain, and even in a sandstorm. The automobile plant Ural displayed the new Ural VV three-axle all-terrain vehicle, created specifically for Interior Ministry troops. Designed to transport personnel, the vehicle has a certain degree of protection from shrapnel, small-arms bullets and various kinds of improvised explosive devices and mines. If necessary, the crew can lock itself in and deliver fire from loopholes, as well as from two upper compartments.